Georg Friedrich Handel (1685 to 1759) Hermann-Spielwaren, Coburg, Germany exclusive, limited edition collectible Teddy Bear, hand-made of rich high-grade German mohair, fully jointed, with classic excelsior stuffing. The composer George Friedrich Handel was born 1685 in Halle, Germany. He lived nearly 40 years in England and passed away 1759 in London. In the same genre like the music of Bach (1685-1750), also the music of Handel belongs to the late Baroque. Handel's music is one of the zeniths but also signals the end in baroque music. Handel is famous for his operas and for his oratorios like The Messiah. But the most loved and world-wide most known parts of Handel's compositions are without any doubt his Fireworks and Water Music. Handel was buried in Londons Westminster Abbey. 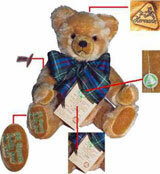 HERMANN-Spielwaren is one of the oldest still existing Teddy Bear companies in the world, founded in 1920 in Neufang near Sonneberg, Thuringia. The company is world-famous for their craftmanship, extraordinary designs, exclusive small editions and that every bear, hand-made in Coburg, Germany has its own personality. Musical Bear. His musical movement plays the melody "Hallelujah" from the Oratorium "Messiah" by G.F. Handel. Hermann 192273. Limited Edition of 500.